CAMBRIDGE – Government programs to support retirees are in trouble in every country, owing to increasing life expectancy and the rising ratio of retirees to taxpayers. The problem will worsen in the years ahead as the adverse demographic trend increases the fiscal burden of funding pensions and health care. The problem is uniquely different in the United States, because America’s “trust fund” system of financing Social Security will create a crisis when the fund is exhausted. Though the options at that time will be different from the choices facing other governments, policies to avoid the US crisis are relevant to other countries that confront population aging. Individuals are entitled to benefits at age 67 based on their lifetime payroll tax payments, with the option to take actuarially reduced benefits as early as age 62 or to wait until age 72 with an actuarial increase. The annual benefits rise with an individual’s average lifetime earnings, according to a schedule that causes the ratio of benefits to past earnings to decline as those earnings rise. Because of the aging of the population, the total level of benefits is increasing more rapidly than tax collections. In 2010, total Social Security tax revenue was $545 billion and benefit payments totaled $577 billion. Because the interest on the previously accumulated bonds was $108 billion, the total size of the trust fund increased by $76 billion. Six years later, in 2016, the tax revenue was up to $679 billion and the benefits were up to $769 billion. The resulting cash deficit was $90 billion, almost exactly equal to the interest that year, leaving the size of the trust fund relatively unchanged. Since 2016, the benefit payments have exceeded the combination of the tax funds and the interest, causing the trust fund balance to decline. 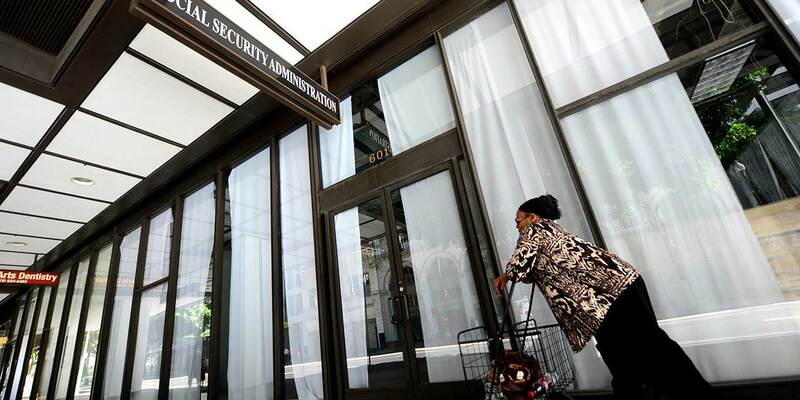 Looking ahead, the Social Security Administration’s actuaries estimate that the annual decline in the trust fund will continue, until the balance is zero in 2034. At that point, the trust fund will no longer have any interest income. Because benefits can be paid only from the trust fund, the benefits will have to be decreased to the amount of the taxes being received that year. If Congress does not change the law, the actuaries predict that benefits would have to be reduced immediately in 2034 by 21%. Alternatively, to avoid that 21% reduction, the tax would have to rise by 26.5%, from a combined 12.4% to nearly 16%. While it is hard to predict what a future Congress will do, I find it hard to believe that a majority would vote to reduce the level of benefits by 21% or to increase the level of the payroll tax paid by all employers and all employees by 26%. The most likely alternative would be to use general income tax revenue to maintain the level of benefits. That would require an increase in personal tax rates of about 10%. That strategy would shift the burden of the Social Security program to higher-income households, which pay the bulk of personal income taxes. That may explain why left-of-center politicians are not trying to avoid the future Social Security crisis. The crisis in 2034 could be prevented by increasing the standard Social Security retirement age, as the US did in 1983. Back then, with Social Security’s finances in trouble, Congress agreed on a bipartisan basis to raise gradually the standard retirement age from 65 to 67. Since then, life expectancy for someone at that age has increased by three years. Congress could now vote to increase gradually the standard Social Security retirement age by another three years, from 67 to 70. Because life expectancy at 67 is about 17 years, a three-year increase in the age for full benefits would be a 17% reduction in lifetime benefits, almost enough to offset the shortfall that results from the reduced revenue. It would be even better to adjust the annual retirement age each year for the actuarial increase in life expectancy. An alternative strategy for dealing with the increasing cost of retiree benefits would be to move away from a pure pay-as-you-go (PAYG) system by adding an investment-based component. Instead of investing the revenue from the 12.4% payroll tax in government bonds, a significant portion could be invested in a portfolio of equities, as corporate pension systems do. The trust fund would then grow more rapidly, and the crisis would be avoided. Although the trust fund system in the US creates the prospect of a crisis when the fund is exhausted, the remedies to avoid that outcome would help other countries that now have a PAYG system – increasing the age for full benefits or combining the existing system with equity funding. The sooner these changes are made, the more viable the fiscal situation – and the more reliable future benefits – will be. Martin Feldstein, Professor of Economics at Harvard University and President Emeritus of the National Bureau of Economic Research, chaired President Ronald Reagan’s Council of Economic Advisers from 1982 to 1984. In 2006, he was appointed to President Bush's Foreign Intelligence Advisory Board, and, in 2009, was appointed to President Obama's Economic Recovery Advisory Board. Currently, he is on the board of directors of the Council on Foreign Relations, the Trilateral Commission, and the Group of 30, a non-profit, international body that seeks greater understanding of global economic issues.